Which factors empowered private sector companies to develop, market, and sell on-farm storage devices to smallholders in Kenya? Which factors hindered others' success? This Lessons Learned article explores the perspectives of those competitors who participated in the Kenya On-Farm Storage Challenge Project. 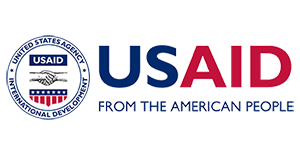 Written by Tanager, the Project Manager for the Kenya On-Farm Storage Challenge Project, this report summarizes the objectives, approach, and achievements of the project, which aimed to encourage sales of on-farm grain storage devices to smallholder farmers. 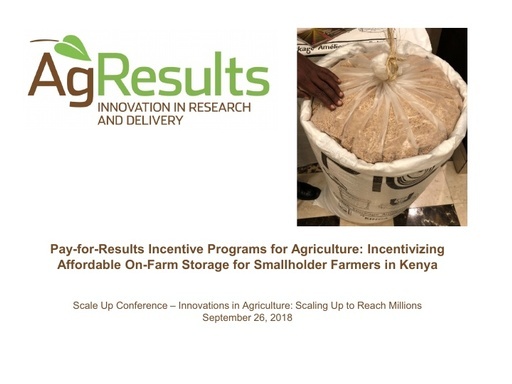 This presentation from the Scaling Up Conference at Purdue University in September 2018 explores how private sector companies participating in the Kenya On-Farm Storage Challenge Project employed different tactics to increase smallholder farmers' access to and use of on-farm storage devices. 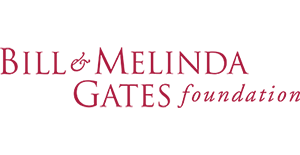 How do you design an effective approach to project verification in a Pay-for-Results project? 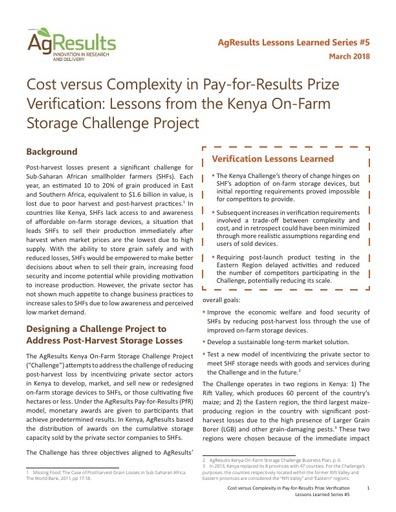 This Lessons Learned article explains how the Kenya On-Farm Storage Challenge Project ran into challenges with its original verification structure and course-corrected using survey data. 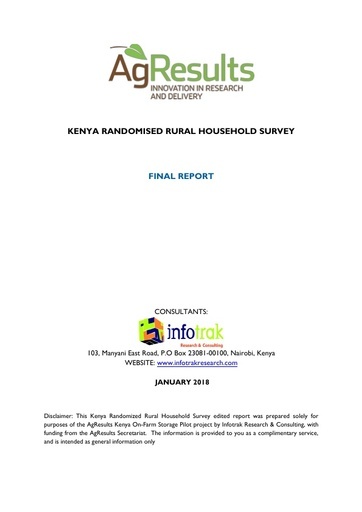 This report from January 2018 presents the findings from a Randomized Rural Household Survey (RRHS) conducted in 14 counties of Kenya as part of the AgResults Kenya On-Farm Storage Challenge Project. The RRHS aimed to understand the proportion of smallholder farmers living in those 14 counties where the project worked and to estimate the number of on-farm storage devices purchased by those farmers. Pull mechanisms require a solid understanding of the market and the motivations of the private sector. 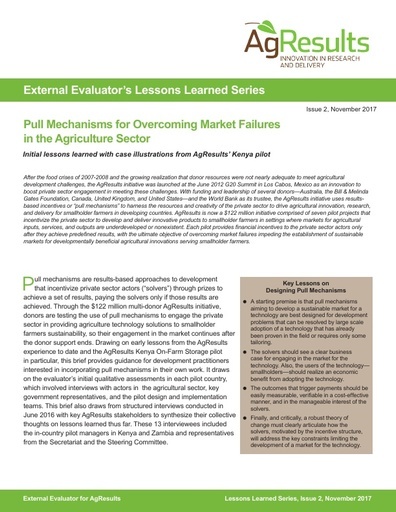 This November 2017 brief, with examples from AgResults’ work in Kenya, provides guidance for development practitioners interested in incorporating pull mechanisms in their own work. This report presents baseline findings for the Kenya On Farm Storage Challenge Project based on survey data from 4,765 farming households and extensive qualitative data. It describes low uptake of improved on-farm storage at baseline but identifies latent demand in the market. The report also describes farmers’ maize revenue and food security. 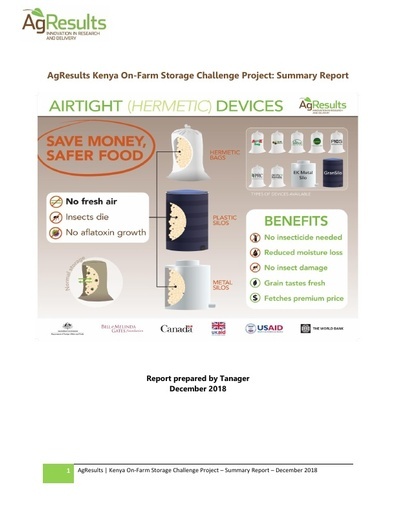 The Kenya On-Farm Storage Challenge Project’s evaluation design report lays out the approach to assess whether the project stimulates a smallholder-inclusive market for improved on-farm storage devices. 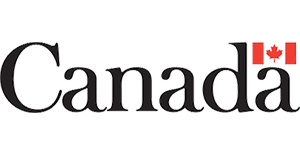 Evaluators assess impact on the market using a structure-conduct-performance framework. 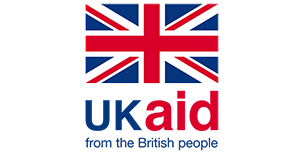 To evaluate resulting smallholder benefits, the report describes a short interrupted time series design.